Humans!!! 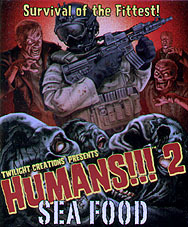 2 Sea Food lets you become a member of an elite zombie force: The Zombie Navy! You never signed up for this! Requires the Humans!!! core set to play.